I’m ashamed to say I’d never heard of Signatures before Conwy Feast. When the idea of cooking a supper club with Jimmy was first mentioned I quickly went off to do my research. I discovered that Jimmy Williams, the executive chef at Signatures has some fine credentials. Gold medal winning chef; part of the Welsh culinary team. I was quite daunted at the prospect of meeting him and kicking myself that I hadn’t been paying more attention to what is a slowly improving local culinary scene, especially when I regularly bemoan our lack of decent eating establishments. Of course once I’d met and worked with Jimmy I realised how welcoming and talented he is and so I had to go and see Signatures and taste his food for myself. It would have been rude not to. So we booked for the family and made it our post festival treat, well-earned and totally justified. Just to add, before you claim my review is biased, most people will know that I’m not one to shy away from speaking my mind and so I promise complete honesty. 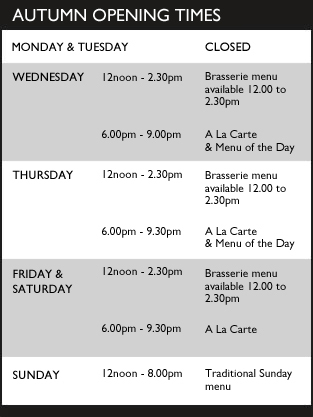 I was rather confused when I first visited the restaurant, to find it situated in an upmarket caravan/holiday park. I thought it was a strange place to find a quality restaurant and wondered whether customers had trouble finding it stuck as it is outside the main town. I guess from what I have heard that it gets great business from those staying at the park and since its reputation is growing, word of mouth is enough to bring in the rest. I have to say on my first visit I was a bit overwhelmed by the decor. It’s not at all what I’d expected, especially for North Wales and it did look as if a fashionable city restaurant had just been plonked down in the middle of the park. It’s not a rustic, casual drop in kind of place, in fact it’s quite glitzy with just a hint of eighties bling, but still with undeniable style. Now I am pretty comfortable taking my unruly kids to restaurants, even quite posh ones, but im not sure everyone would be. Although it is certainly less formal than a high-end fine dining establishment, it was still formal enough for me to wish my son hadn’t fallen in the harbour during the afternoon…his slightly muddy appearance and vague aroma of sea life made me want to hide him in the corner! To be honest though no-one batted an eyelid so before anyone looked more closely at him we settled ourselves in the lounge where the attentive waiter wasted no time in taking drinks orders. Since we were a little early there was plenty of time to sit and relax after a hectic day and take a leisurely look over the menu. The waiter also gave us a children’s menu with its ubiquitous pizza, sausage and chicken or fish goujons. I’m not keen on children’s menu’s. I’d rather restaurants offered kids smaller, maybe less fancy portions of the adult dishes. I’ve always believed in getting them started in appreciating proper food early and although I know not everyone has such food loving kids, I’m still not sure a restaurant such as this should indulge the pizza generation…but thats just my opinion! Aidan did in fact spurn the children’s menu opting for his favourite roast beef dinner. 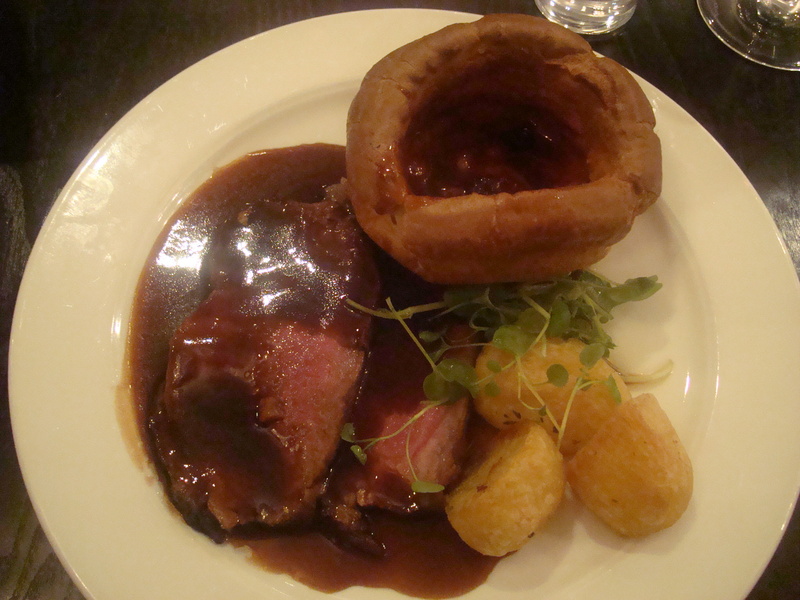 In fact my father, step-mother and I also went for the beef, I think we were in need of a really good dinner! Sean opted for Welsh lamb shoulder and Roisin in her own bizarre style asked for chicken breast with yorkshire pudding and no gravy. 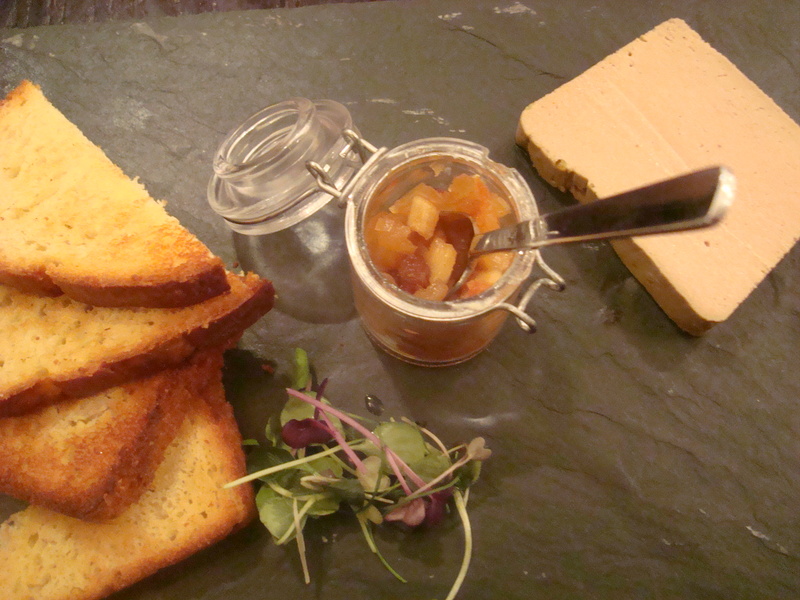 For starter she chose soup of the day which was vegetable as did my step-mum, Sean chose warm smoked salmon with sautéed potatoes and a watercress and orange salad and Dad and I went for Chicken liver pate with toasted brioche and fruit chutney. So while our food was prepared we continued to chill out with our drinks. 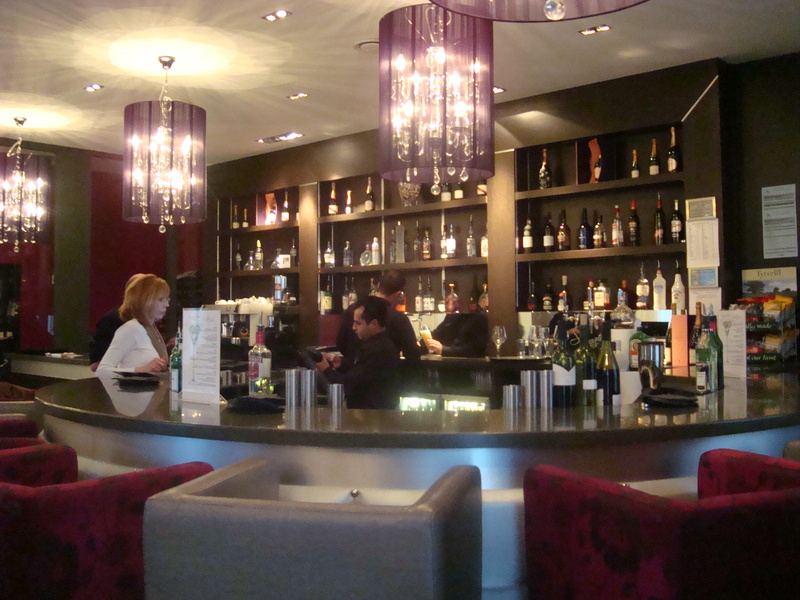 There was no pressure to hurry and it was a lovely relaxed environment. Our waitress eventually escorted us to our table where we were presented with a bowl of fresh warm bread, something else they make at the restaurant. 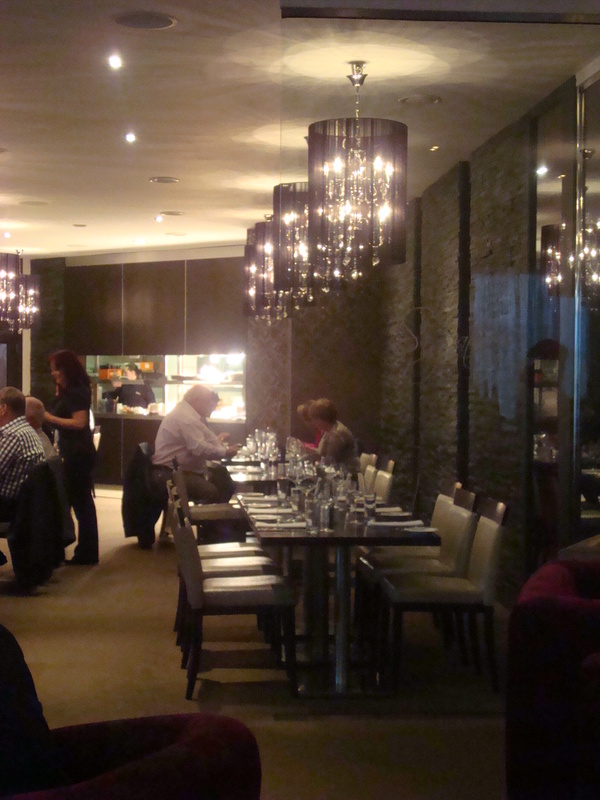 Shortly afterwards our starters arrived. 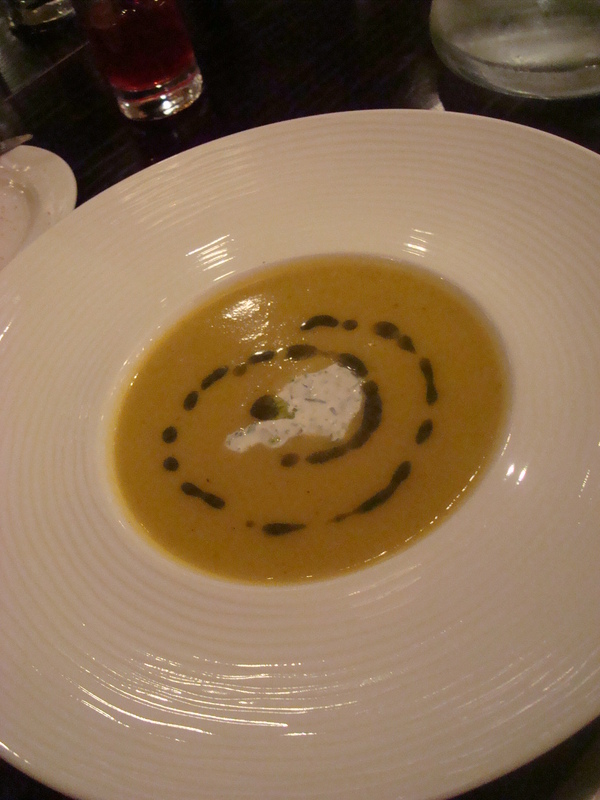 The soup was tasty and flavoursome, although not wildly exciting, the salmon was a lovely combination of flavours, but Sean refused to let me photograph it. He hates me reviewing and wont be part of it! The pate was delicious. Mild, delicate and creamy it contrasted well with the sweetness of the really lovely fruity chutney and buttery brioche. With four of us having roast beef, Sean refusing to let me take a picture of his lamb and Roisin proceeding to fill her yorkshire pudding with chopped chicken breast, potato and broccoli there was little to do but get on with eating. Aidan had already been to the counter of the open plan kitchen, chatted to the chefs, checked out what they were doing and demanded the biggest yorkshire pudding they had with extra gravy. I don’t think all kids would get away with that! beef with all the trimmings and the most enormous yorkshire puddings!! The meal was perfect. Roisin said it was the best chicken breast she had EVER had and Aidan said the yorkshire puddings were better than mine (although I think this assertion was based on size alone!). Sean loved the lamb (that’s all he would say) and the beef was tender, cooked medium as requested and the potatoes were golden and crispy. My main bug bear when I eat out is usually restaurant portion sizes, but there were no such complaints here. We were all heartily full, but not over full. We only realised afterwards that we could have had more vegetables if only we’d asked, so that’s our fault really. Of course we saved some room for pudding. Four of our party opted for the trio of home-made ice cream and sorbet (combinations of raspberry sorbet, vanilla ice cream, chocolate ice cream, milk sorbet). The fruitier sorbet was lovely, really tangy and full of flavour, but the milk sorbet was a bit nondescript for me, I like big flavours and this was rather too subtle. The vanilla wasn’t as popular as the rest either. We agreed it needed a stronger hit of vanilla and tasted more like frozen cream than ice cream. 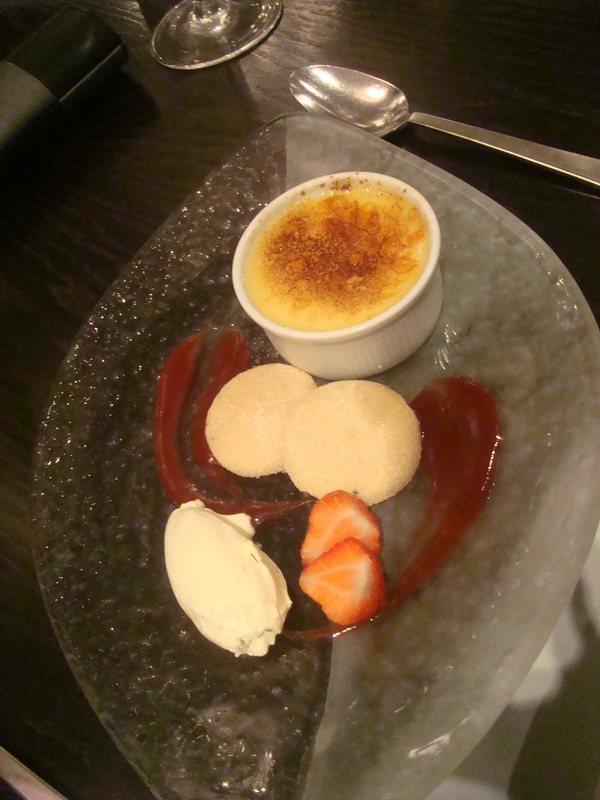 Dad chose the Irish cream coffee brulee with vanilla shortbread and milk sorbet, which sounded like rather a rich combination, but he said it was lovely and I opted for the pannacotta with mixed berry compote. I can’t remember what the sorbet was, raspberry I think, but I do remember it was delicious! 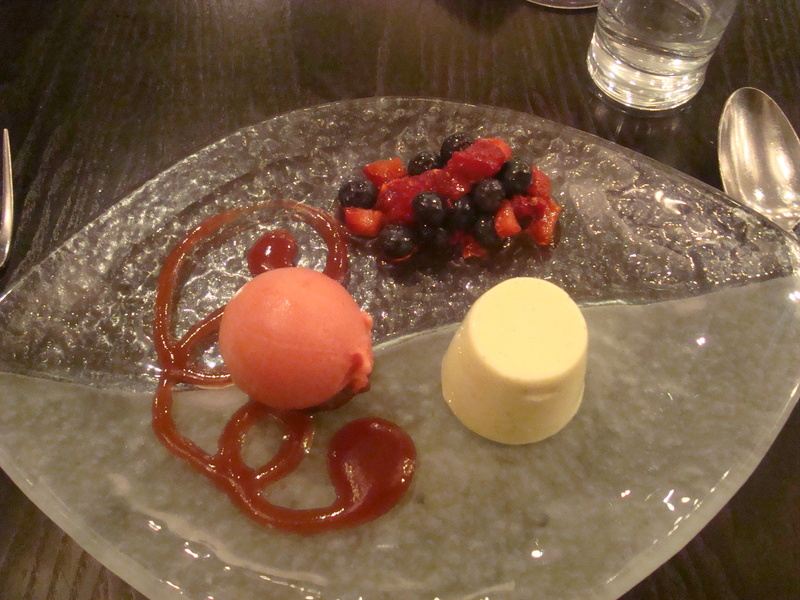 personally I would have liked a bigger pannacotta but then I’m a greedy girl and pannacotta is one of my favourites. 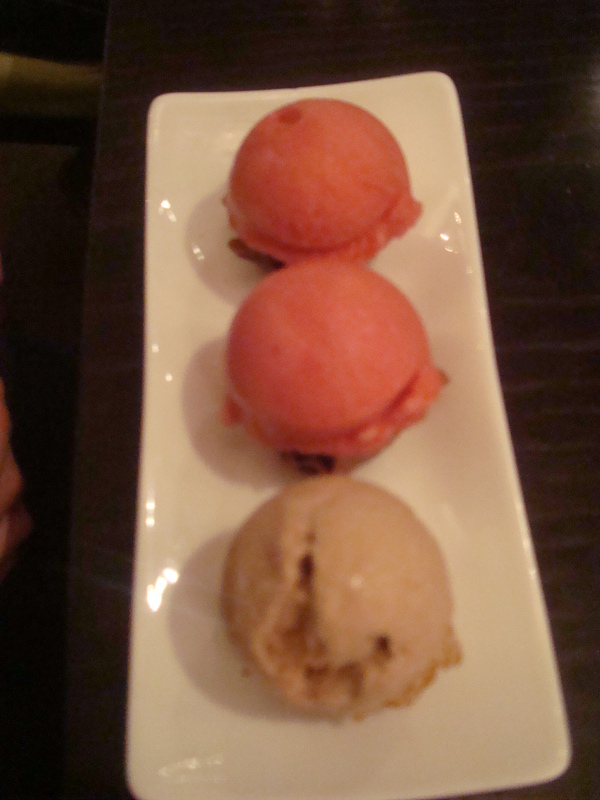 trio of ice cream and sorbet: chocolate, raspberry and strawberry. All made on the premises. 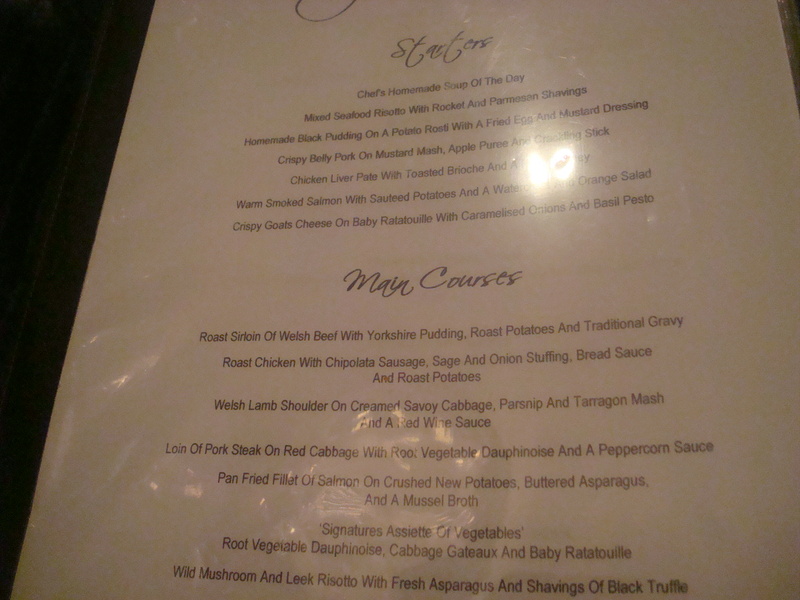 At £19.95 for three courses I would say this is very good value. 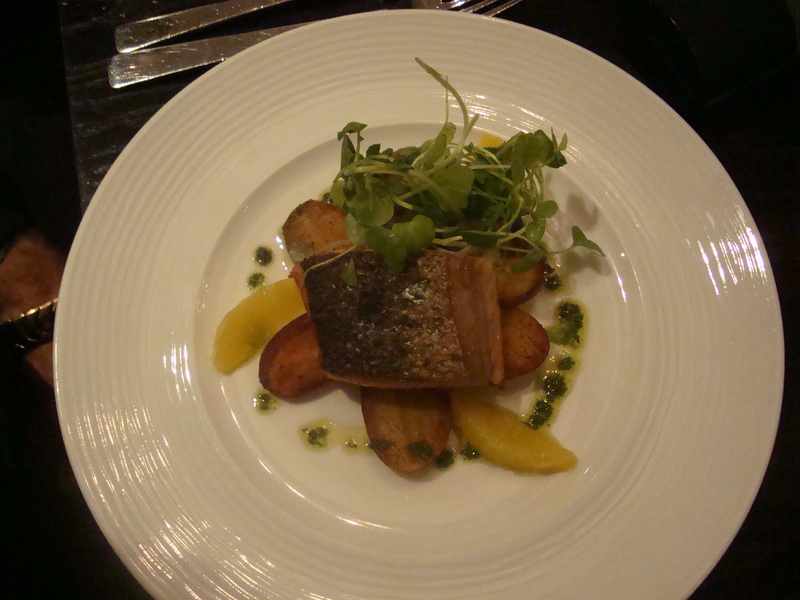 The standard of the food was exceptional, it was beautifully cooked and presented and the service was excellent. Some people don’t like an open plan kitchen but I think it makes for a more friendly environment. You can see who is cooking your food and that gives a greater appreciation of the attention they give to detail at Signatures. I can honestly say they impressed me. The food wasn’t as fussed about with as I’d anticipated (mainly based on Jimmy’s OCD need for tiny perfect portions for his Conwy Feast menu) and the portions satisfied even the biggest appetite. Based on this experience I will definitely be making a return visit. Next time though I think it will be minus the kids and on a grown up evening out.